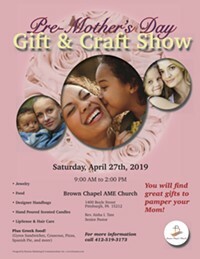 When: Sat., April 27, 9 a.m.-2 p.m.
Find Great Gift to Pamper Your Mom! Pre-Mother's Day Gift and Craft Show The Pre-Mother's Day Gift and Craft Show will be on Saturday, April 27th at Brown Chapel AME Church, 1400 Boyle Street, Pittsburgh, PA 15212. At the event, you will find jewelry, designer handbags, fashion, food and more! Vendors are still needed! To get the vendor application send me your email address.